In his more than 11 years as a golf teaching professional, Eric Cogorno has quickly built a reputation as a highly respected Performance Golf Coach. He is intuitively able to combine the art and science of golf to design (seemingly) simple strategies unique to each individual student that lead to significantly improved performance for golfers at all levels. On a mission to develop more engaging ways for people to play and enjoy golf, Eric’s passion for the game - and for producing results for his students - is contagious. He believes in working on, improving and building skills in all areas of the game and applies that same discipline to his own continuing development as a coach. His unique, game-like style of teaching creates an environment where even the learning is addictive. Viewers have clicked on Eric's popular YouTube channel from 193 locations across the world, and some have become clients. Cogorno has given lessons to players he met through the channel, some who have driven from New York and Virginia or flown from Florida, Arizona and even South Korea for a swing look. Born and raised in the Lehigh Valley, PA, Eric was a scratch golfer by the age of 15. He golfed throughout high school and while attending Lehigh University. During his time as a competitive golfer, he won numerous tournaments and was twice awarded the Golf Association of the Lehigh Valley Player of the Year Award. A self-proclaimed “Golf Geek”, Eric resides in Bethlehem, PA and offers instruction at Bethlehem Golf Club. If you feel like you’ve tried everything to build rotation into your swing and you still can’t get it, then Eric Cogorno’s ROTATION MASTER CLASS is for you! All elite-level ball strikers rotate really well. Rotation is essential for strike, power, distance and control. And now you have access to the most comprehensive system to add and improve your own rotation with Eric Cogorno’s ROTATION MASTER CLASS. Specifically designed by Performance Golf Coach and Golf Influencer, Eric Cogorno, the ROTATION MASTER CLASS is a progressive program of the most current methods of adding and improving rotation in the golf swing. Unlike other one-off videos or quick fixes, this is a comprehensive program that takes you step-by-step through the process. For a price that wouldn’t even cover one round at a decent course - let alone a private lesson with Eric - you can discover his proven strategy to rotate once and for all. What people on social media are saying about Eric’s methods for adding and improving rotation in the golf swing: “This is the best tip on rotation I have seen bar none. Thank you for sharing your wealth of knowledge so generously with us. It is much appreciated. Your videos will make all of us better golfers.” Gerald Tan “Best drills I have ever seen on the subject. No BS, no confusion.” Randy Underwood “… I thought I was rotating okay. But your idea of having hips square to target after swing proves I'm a slider not a rotator. It's funny how you can believe you're doing one thing when in fact you're doing something else. Thanks...” Ron Mortimer “Outstanding info! I’ve been sliding forever – no one ever said to turn! Also, I use your chest opening drill at the top of my swing and that’s been a game changer! Can’t thank you enough! Todd Sieja So, what's included in Eric Cogorno’s ROTATION MASTER CLASS… Purchase now and get instant access to 19 videos of Eric walking you through the entire ROTATION MASTER CLASS. It’s the exact same way he would guide you through the process if you were together at the range. With more than 75 minutes of content, you'll learn: -Root causes that are keeping you from rotating -Exactly what you need to do to set yourself up to rotate well -How to add and improve rotation in every part of your swing -A series of drills and moves specifically designed to train you to rotate -How to use feedback to guide your practice along the way Don’t let this chance to improve your golf game and lower your scores pass you by! Is your slice ruining your golf game? When you hit a golf shot over and over that leads to high scores and bad contact it’s not fun. It’s also not fun when you hit that same bad shot over-and-over for 5, 10, 15 or even 20 years and you still can’t fix it. It can be frustrating to the point where you don’t even want to play golf anymore. That shouldn’t be the case. The SLICE FIX TRAINING PROGRAM is the first of its kind golf-training program that fixes a slice – EVERY SINGLE TIME – no matter who is swinging the club. Specifically designed by Performance Golf Coach and Golf Influencer Eric Cogorno to model the proven efficacy of training programs in fitness and other sports, Eric Cogorno’s SLICE FIX TRAINING PROGRAM IS your blueprint for success. Your long-term goal is to stop hitting a slice forever. The SLICE FIX TRAINING PROGRAM breaks that goal down into smaller, achievable short-term goals. Every time you successfully complete one of the steps of the SLICE FIX TRAINING PROGRAM, you’ll be passing a milepost on the way to your long-term goal of never hitting a slice again! By looking back at how you’ve progressed through the program, you’ll have much-needed positive reinforcement along the way. Most importantly, having this program laid out for you means you will never lose track of what you’re supposed to do next. Fixing your slice is as simple as reading, watching and implementing the program we’ve created just for you. For a price that wouldn’t even cover one round at a decent course - let alone a private lesson with Eric - you can discover his proven strategy for getting rid of your slice The number one problem for people that don’t shoot the golf scores they want to shoot is the slice pattern. Over the past 10 years of helping players cure their slice, I’ve developed a proven, fool-proof, step-by-step program to get rid of it. This is the first time we’ve packaged our system for the public. -Eric Cogorno, PGA What people on Social Media are saying about Eric Cogorno “No lie…watching your videos dropped me to the eighties consistently. Thanks.” -Carlos Canales “ l have been playing this game for 42 years, have watched countless instructional videos, read a few books, and taken a half dozen lessons. The past week, I have been watching tons of your videos. Eric, you are by far the BEST teacher I have ever seen. Dude, your understanding and teaching concepts of this game are phenomenal...If I had millions I would fund your schools worldwide... ” -Mike Blankenship “…I was so inconsistent before and had no idea what I was doing wrong. I have had lessons in the past and nobody ever talked about this or explained it the way you did. It just makes sense to me. In just a week of practice, this has improved my score immensely. Thank you! ” -Hugo Cosioi So, what's included... You get The SLICE FIX TRAINING PROGRAM book, which takes all of the guessing out of the process. In the book, Eric teaches you the fundamental reason why you struggle with the rightward shot and the exact steps you need to follow to finally fix it for good. You get instant access to 16 companion videos of Eric walking you through the entire program. It’s the exact same way he would guide you through the process if you were together at the range. You also get TWO Bonus Drill videos that will help you fast track your way to better shots. You can access THE ENTIRE PROGRAM…from anywhere, and at any time, on your smart-phone or computer, through your Internet connection…even on the range. ​ It’s just like having Eric Cogorno as your life-long coach and Slice Doctor that you can come back to again and again. In a few short range sessions, after following Eric’s advice you’ll feel like you are truly controlling your shots. You’ll know exactly why you’re hitting the shots you hit. And, more importantly, you’ll know exactly what you need to do to fix it. 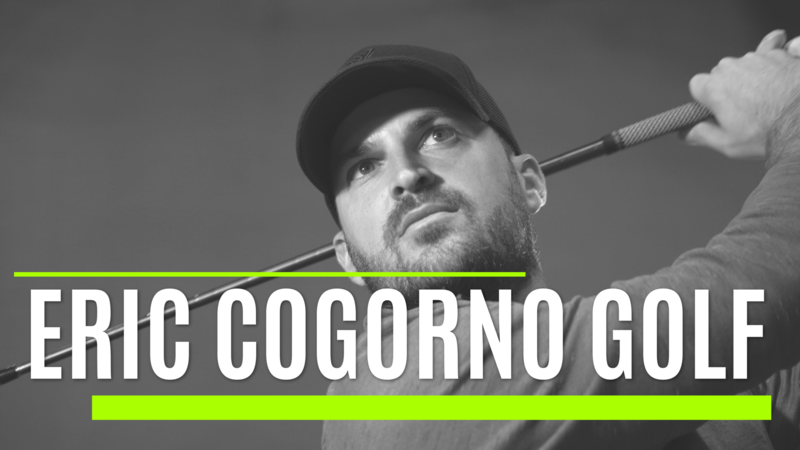 Get golf tips and drills, product launch info, and special deals by signing up for Eric Cogorno Golf updates.